Federal officials are proposing approving Idaho's request to loosen field burning rules that backers say offer more flexibility to disperse smoke away from people but that health advocates say will lead to breathing problems for some area residents. The U.S. Environmental Protection Agency on Monday proposed allowing field burning in the state during worse air quality thresholds for ozone. 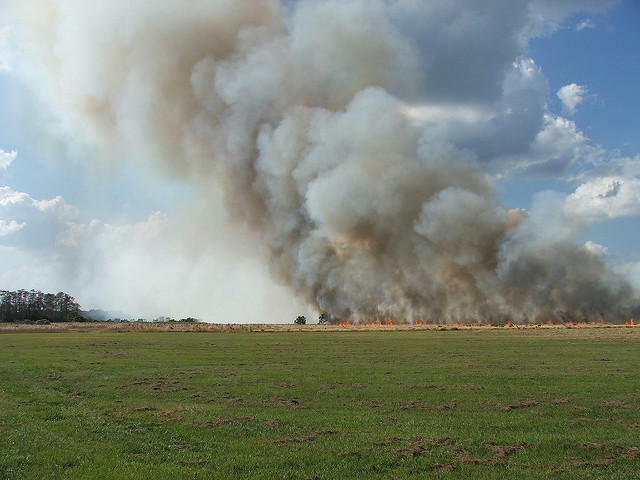 The agency in a statement said the new rules "may result in better general smoke dispersion and reduced smoke impacts in areas affected by agricultural residue burning." Field burning rids fields of stubble and pests. In Idaho, it runs from March to September, with about 35,000 to 45,000 acres burned annually. Rural areas can have high background ozone levels, and health advocates say combining increased ozone with particulate matter caused by field burning can trigger health problems in children, the elderly, and those with lung diseases. "They don't consider that when ozone levels are higher, that inflames your lungs and makes it much harder to recover from a high (particulate matter) event," said Patti Gora-McRavin of Safe Air For Everyone. Currently, farmers are allowed to burn fields when ozone levels are less than 75 percent of the EPA limit of 75 parts per billion, and had faced a reduction to 75 percent of 70 parts per billion under new federal rules. Idaho officials said that would have eliminated a third to a half of potential field burning days in the state. The new Idaho rules will allow field burning at 90 percent of 70 parts per billion. The Idaho Department of Environmental Quality said that's enough of a difference to significantly increase the number of potential field burning days, making it possible to burn on days when weather conditions will lift smoke straight up and away from people on the ground. "Our goal is that nobody breathe any of this," said John Tippets, director of the Idaho Department of Environmental Quality. Field burning was banned in Idaho in early 2007 after the 9th U.S. Circuit of Appeals agreed with Safe Air For Everyone that the EPA's approval of Idaho field burning at the time didn't follow federal law. Safe Air documented what it said were numerous deaths due to breathing problems from field burning as well as car crashes caused by smoke limiting visibility on highways. Field burning resumed in 2008 after Safe Air, farmers and state officials agreed on limits for when field burning could take place. Gora-McRavin said her group has recorded no deaths due to field burning since then. Tippets said that following those rules being put in place, complaints about field burning in Idaho dropped from thousands per year to about 20 annually. He said the change now being proposed is mostly keeping the status quo while allowing more flexibility. "I absolutely believe that it's protective of public health," he said. "We believe it's going to be more protective of public health." Gora-McRavin said her group is not convinced, especially because the state ignored a proposal to decrease allowable particulate matter from field burning in exchange for an increase in ozone levels. "We didn't necessarily disagree with their proposal (on ozone)," she said. "But we wanted to add a comparable particulate matter safety level so people don't get a double dose of lung irritants." The EPA is taking comments on the new plan through Feb. 21.